Do museums matter, especially when it comes to enabling and challenging contemporary artistic practice and process? Today’s contemporary condition of technological advancement and changing audience behaviour has led to a questioning of the relevance of long-standing institutions like museums. In response, museums have had to evolve beyond being mere cabinets of curiosities to play multiple roles including exhibiting and education. The expanded and evolving role of the museum indicates its potential as a significant source of support for artists, particularly emerging ones. 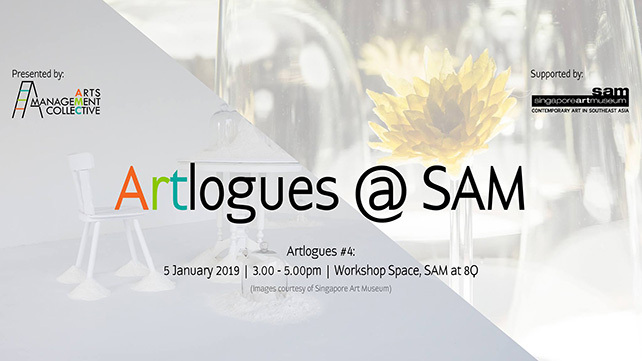 In 2001, the Singapore Art Museum(SAM) initiated the President’s Young Talents (PYT), a mentoring, commissioning and award programme to support young promising artists to grow and chart new dimensions in Singapore contemporary art. Previous PYT winners include Boo Junfeng, Donna Ong and Vertical Submarine, among others. Join Ezzam Rahman, joint winner of the PYT Grand Prize 2015 and winner of SAM’s People’s Choice Award, to hear about the influence of PYT on his artistic practice, process and growth. This retrospective sharing will also include a reflection upon the possibilities of exchange between artists, museums and the broader cultural landscape. To enable experiential learning, this session will conclude with a short tour of the President’s Young Talents 2018 exhibition, which will be led by a SAM student docent.